Citizens for Justice and Peace (CJP) is a human rights movement dedicated to upholding and defending our fundamental freedoms, in the courts and beyond. With a presence in all states of India, CJP draws its strength from the commitment of people like you - people who are determined to protect the rights of every individual, especially the weak and marginalised. We endeavour to protect the rights of voiceless and marginalised people belonging to different socio-cultural minorities including but not limited to ethnic, caste, religious, sexual and gender: through direct Legal Interventions, powerful Public Campaigns, and effective partnership with Human Rights Defenders. We work to protect. Rights guaranteed to us in the Constitution are being violated every day. We must fight back. Free speech is an inalienable right of every Indian as is the Right to Protest. The Rights of our Children are not-negotiable. Discrimination and Hate have no place in our world. At the root is the urgent need to democratise and reform our criminal justice system. 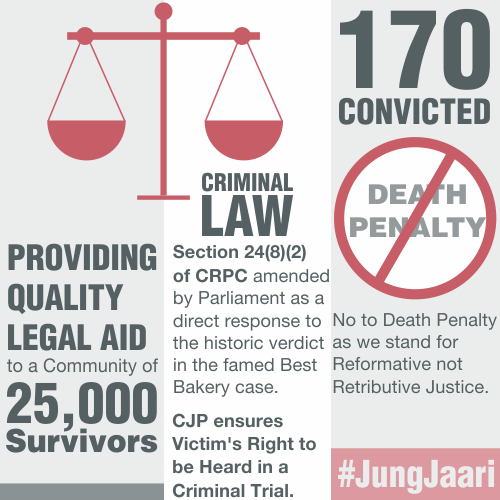 CJP's work has ensured that Voices of Victims and Survivors of Injustice are heard. Citizens for Justice and Peace (CJP) is a human rights movement dedicated to upholding and defending our fundamental freedoms, in the courts and beyond. We work to protect the rights of voiceless and marginalised people belonging to different socio-cultural minorities including but not limited to ethnic, caste, religious, sexual and gender: through direct Legal Interventions, powerful Public Campaigns, and effective partnership with Human Rights Defenders. We believe that Free speech is an inalienable right of every Indian as is the Right to Protest. The Rights of our Children are not-negotiable. Discrimination and Hate have no place in our world. There is also an urgent need to democratise and reform our criminal justice system. With your support we can make all this possible. Rs. 500Help us file 50 Complaints with the National and State Human Rights Commissions. Rs. 1,000Help us file 100 Complaints with the National and State Human Rights Commissions. Rs. 5,000Help us Create Online Campaigns, Promote on-the-ground Reportage, File FIRs (First Information Report) against Human Rights violations and Take Human Rights Education into schools. Rs. 10,000Enable us to file One Case on Human Rights Violations in Court or Send one Investigator on a Fact-finding mission. 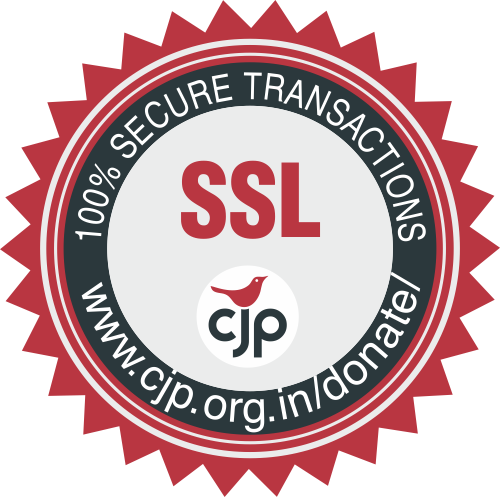 All Donations to CJP are 50% Tax Exempt under section 80G of IT Act, 1961.